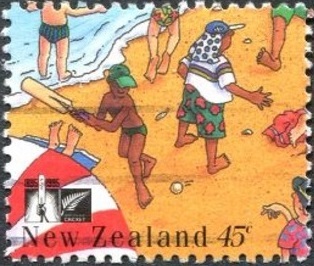 One of the most popular summer pastimes in New Zealand is to go down to the beach - swim, sunbathe, picnic and have a game of beach cricket. 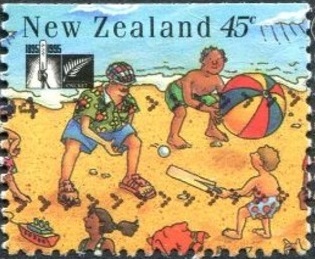 It only needs a softball and a piece of wood for a bat, a few sticks for the wickets and the fun begins. 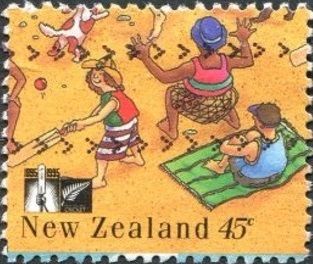 This game bears little resemblance to the cricket of the stadium or even the village green - there are few rules, no age limits and as many people as care to can play at once. 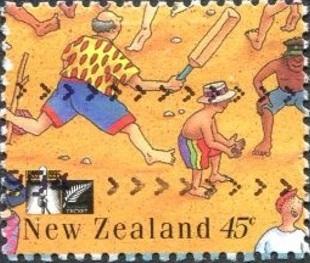 NZ Post issued this booklet as part of marking this important milestone in the history of cricket in New Zealand. 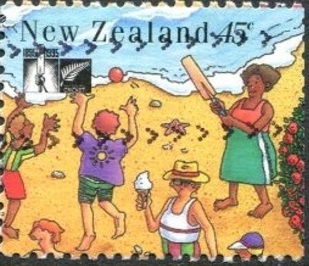 1994 Centenary of the New Zealand Cricket Council. 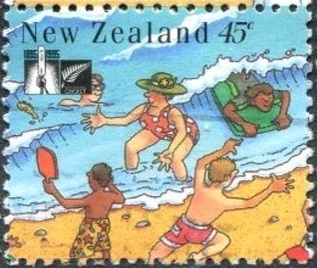 The ball goes flying over the heads of the fielders and is caught by the guy in the surf. "He's out!" everyone calls. 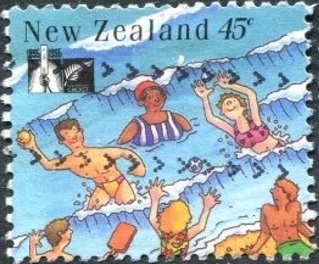 Doesn't matter that the swimmer wasn't playing. 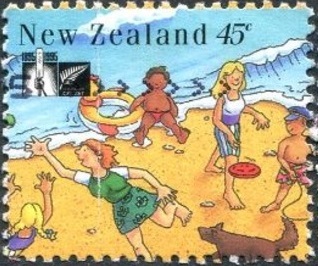 and other activities usual for a beach. If you don't want to catch a cricket ball, try catching a frizbee. Haven't got a cricket ball. No problems - try a beach ball. That should be a lot of fun. she really knows how to wack it." Now junior has the bat. He's good. Look at that fancy footwork. Now, Dad is batting. "Wow! Look at him go." "Oh dear! Now it is my sister's turn. Let's not say anything more about her." There goes auntie now. Making a run to the other wicket. Even little sister has a go too. 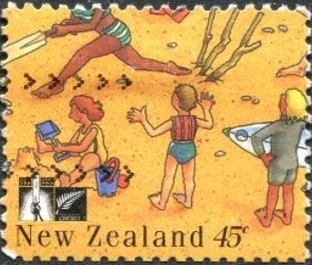 It's beach cricket. Everyone plays, everyone has fun. Half the time we have no idea which side won. 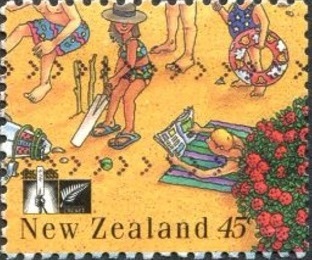 First Day Cover - 2 November 1994.